From Corfu to Lefkada via Igoumenitsa – an alternative route that is 50% cheaper and much more fun! We have noticed in the last few years how expensive it has become to fly to Preveza airport. Of course the reason is that the charter airlines have a monopoly, and there is no competition from budget airlines such as Ryanair or Easyjet. Another problem is that all the flights are on just one day each week, so there is no alternative to a one or two week holiday to Lefkada. Last week we had to go to Lefkada for a short visit which was part business and part pleasure. We could only depart on Monday and had to return home on Friday. This was impossible with flights to Preveza. Flying to Athens was also expensive, and involved a long bus journey from Athens to Lefkada. 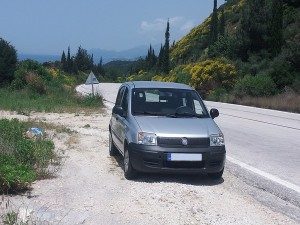 So we found that the best way of travelling to Lefkas was by flying to Corfu, taking the ferry to Igoumenitsa, and then hiring a car in Igoumenitsa. This is how we did it; maybe our story will encourage you to do the same. Our two nearest airports are Manchester and Gatwick airport, both of which are between 2 and 3 hours drive away. 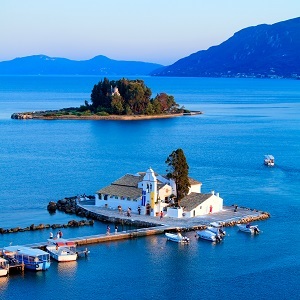 Flights from both airports to Preveza are on Sunday, and the cheapest cost of the return flight was between £335 and £365 (about 400 – 420 Euros) in May. Plus car parking charges of about £100 (120 Euros) which was £50 (60 Euros) each. As an alternative we checked online for flights to Corfu. We found a Ryanair flight from Stansted to Corfu on Monday, and a return flight on Friday with ThomsonFly from Corfu to East Midlands airport, near Leicester. The total cost of the return flights was £100 (120 Euros) per person. Our train tickets from Leicester to Stansted cost £18 each (about 22 Euros), and the bus from East Midlands airport to Leicester cost £5 (about 6 Euros). Because we arrived at Corfu airport at 21.45 in the evening, we had booked a room at a hotel near Corfu port that night for only 40 Euros. The taxi from the airport to our hotel only took 5 minutes, and cost 10 Euros. We found the hotel to be clean and comfortable with good WiFi (we could Skype home to tell the family we were ok!). After checking in we went out for a short walk and only 100 metres away we found a great family taverna and enjoyed a delicious supper of spit roast pork and Greek salad. When we asked for two bottles of Amstel the owner just pointed to the fridge and told us to help ourselves – there is nothing like Greek hospitality! We asked the hotel reception about ferries from Corfu to Igoumenitsa. There are ferries about every hour. 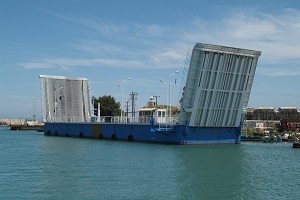 The big ferries take about 90 minutes from Corfu to Igoumenitsa, the smaller ferries take about 2 hours. We were informed by reception that there were fast ferries the next morning at 09.00 and 10.30. We decided on the 09.00. We woke the next morning after a good sleep and walked from the hotel to the ferry port, which was only 5 minutes. We bought our ticket from the ticket office at the entrance to the harbour. The price was 10 Euros each, and we then walked up the ramp onto the ferry. The ferry left on time and we had a great view of the New Fortress and Corfu Town as we left Corfu. Our breakfast consisted of tasty bread rolls and coffee, which we bought on the ferry at a very reasonable price. 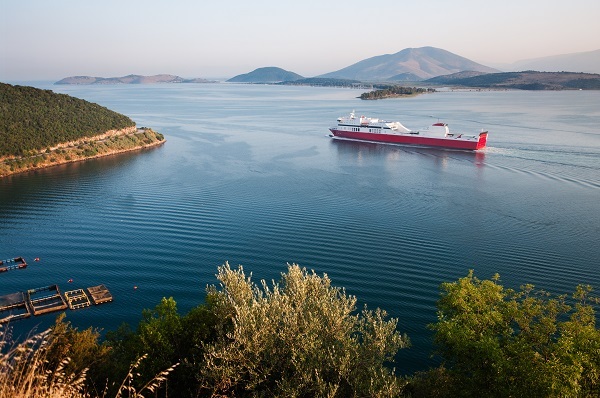 We had already booked our Igoumenitsa car hire online through Skyscanner because they offered great prices. When our ferry arrived in Igoumenitsa the car hire office was only 100 metres away at the North end of the ferry port.. We paid the final amount when we collected our car. A small Group A car for two people turned out to be a nippy modern Fiat Panda, which we were very pleased with. The man in the car hire office was very helpful. When we told him we would be returning the car to Igoumenitsa at 07.00 on our return journey he explained where to park the car, and asked us to leave the key in the letterbox – simple! Our drive from Igoumenitsa to Lefkada was absolutely beautiful. We followed the coastal road, which is wide and well signposted. 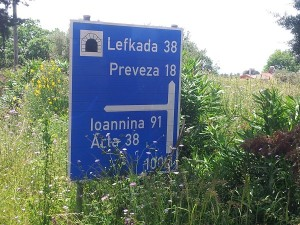 As we reached the city of Preveza we followed the signs to the tunnel and Lefkada. The toll for the tunnel was 3 Euros, and we calculated the petrol cost us 15 Euros. The journey time from Igoumenitsa to Lefkas Town was about two hours, but that was driving without hurrying, and stopping for lots of photos. We arrived in Nidri just after 13.00. We had chosen Dennis Apartments in Nidri for our 3 nights and we were very impressed. The one bedroom apartments were much larger than we expected and were very bright and clean. The air conditioning was useful as even at the end of May it was starting to get hot. 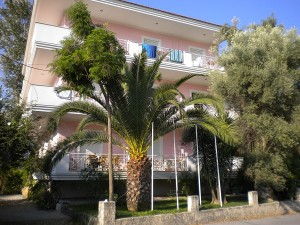 The apartments were close to the beach and all the facilities of Nidri but were down a quiet road away from any noise. Again, we had only paid a 20% deposit through Lantisworld so we paid the rest directly to Dennis. For only 25 Euros per night in May they were excellent value, and we would certainly stay there again. We left at 05.00 on Friday morning as we intended catching the 07.30 ferry from Igoumenitsa to Corfu. The drive was easy and we arrived in Corfu in plenty of time for our 12.15 flight. In fact we had time for bacon and eggs at the ‘Marina Snack Bar’ opposite the ferry port before taking a taxi to the airport. We thought that travelling to Lefkada via Corfu was a great alternative route for both price and fun. If we had flown to Preveza airport our journey to Nidri would have cost us about £450 (640 Euros) each, including car parking at the UK airport. Our total costs by going through Corfu airport and Igoumenitsa were about £190 (230 Euros) including flights, train and bus fares, hotel room in Corfu, ferry and taxi fares in Greece, and the petrol / tunnel between Igoumenitsa and Lefkada. We do not include car hire as we would have hired a car anyway. So overall the price was less than half the cost of flying through Preveza. 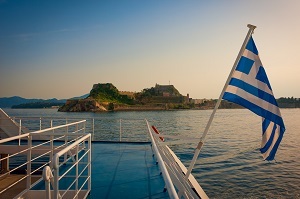 But, just as important as price, the journey through Corfu was so much fun that we would happily recommend it to anybody. 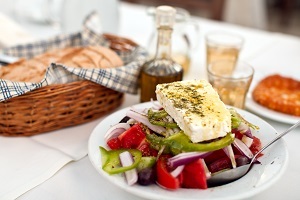 We feel that we have had a real Greek holiday, much more than a standard package holiday would have given us.